Size: 220 x 240 Cms. -30 inches (equivalent of a poster or a body wrap). 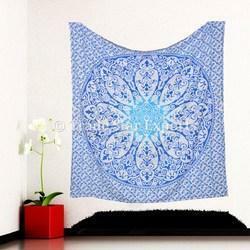 Brighten up any space with this beautiful wall hanging. Perfect to hang on walls or as a table/sofa/bed accent or outdoors as a throw. 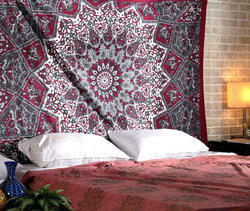 - Description : Exceptionally designed, tree of life carpets echo the cultures of various age old kingdoms of north India. Featuring the patterns of trees, these colorful carpets brighten up the interior decor.